Different units of measurements are used at different stages of the natural gas system. What are these measurement units and what do they mean? Each type of measurement (volume or energy content) can be expressed in metric or imperial measurement units. Though Canada is on the metric system, both metric and imperial measurements are used in Canada. For example, natural gas resources, production, and demand volumes are commonly measured in Trillion Cubic Feet (Tcf), but customer billing in Canada is measured in either cubic metres or Gigajoules. The two units used in Canada for measuring residential customer gas consumption are gigajoules (GJ) or cubic metres (m3). Gigajoules measure natural gas consumption by its energy content, and cubic metres measure consumption by volume. A gigajoule (GJ) is one billion Joules. The amount of energy represented by one GJ is equivalent to 278 kWh. The energy content of natural gas can vary because natural gas can vary in the types of energy gases (methane, ethane, propane, butane) it contains and relative amount of each type. Gases that have more carbon atoms have a higher gigajoule value, whereas gases that are less combustible (with lower carbon atom content) have a lower energy value. When your billing is based on GJ (as is the case in Alberta, British Columbia, New Brunswick, and Nova Scotia), your meter reads your consumption in terms of volume m3 or cf), and the energy content is calculated using a conversion factor. You will see the conversion factor marked on your bill. A cubic metre (m3) is a measurement of gas volume. The standard reference conditions for measurement are a temperature of 15°C and an atmospheric pressure of 101.325 kilopascal (kPa). One m3 is equivalent to about the space taken up by a standard kitchen range. Residential gas consumption in Ontario, Saskatchewan, Manitoba, and Quebec is measured in m3. 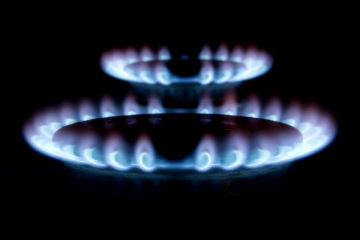 British thermal units (Btu) are the imperial measurement of energy content in natural gas. Certain appliances, such as barbeques, fireplaces, or air conditioners, often display their energy consumption in terms of Btu. One Btu is the amount energy required to heat one pound of water at maximum density by one degree Fahrenheit. It is equivalent to the energy released by completely burning one match. When converting from Gigajoules to imperial, the measurement most commonly used is the Million Btu (MMBtu). Cubic feet is the imperial measurement unit for gas volume at standard reference conditions ( at a pressure base of 14.73 pounds standard per square inch absolute and a temperature base of 60 degrees Fahrenheit). It is equivalent to the area inside a basketball. Natural gas production is usually reported in terms of millions (Mcf), billions (Bcf), whereas reserves are usually measured in trillions (Tcf) of cubic feet. For example, the production capacity of the natural gas assets located in the Wildcat Hills region of Alberta is measured at approximately 10 million cubic feet equivalent per day, whereas Alberta's marketable natural gas production as of 2013 was measured at 3.2 trillion cubic feet. Gas meters measure consumption by volume - either by cubic metres (m3) or cubic feet (m3). However, in many provinces, gas is billed in terms of its energy content - in Gigajoules (GJ). In order to translate the amount of gas measured by the meter into a unit that can be billed, a conversion factor is used. This is a number by which the volume of gas is multiplied in order to determine the amount of energy consumed. The conversion factor takes into account the energy content, the pressure at which the gas was delivered, and the conversion from imperial units to metric (if the meter measures in cubic feet and not cubic metres). The gas supply is measured regularly and the conversion factor may change from time to time to reflect any changes in the energy content of gas.